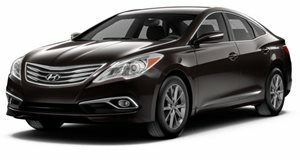 Hyundai has conducted a pricing survey on the upcoming 2012 Azera. South Korean automaker Hyundai has released a survey with pricing options on the 2012 Azera to draw buyer&apos;s reactions. Pricing for the front-wheel-drive model begins at $31,000 with an option package being offered that will tack an additional $4,000 to the price tag. The biggest news from the survey confirms the old port-injected 3.3-liter and 3.8-liter V6&apos;s have been replaced by a new direct-injected 3.3-liter V6 mated to a six-speed automatic transmission. The Grandeur model will offer a 3.0-liter GDI V6 that produces 270 horses, which could be an indication of the new 3.3-liter V6, which should be able to deliver 290-300 horses or perhaps even more. The base Azera comes equipped with a navigation system and features safety equipment standards such as VSM and ESC with traction control. There&apos;s also a seven-speaker audio system, heated front and rear leather seats, 18-inch wheels and Hyundai&apos;s Blue Link telemetric sytem. The $4,000 Premium Package will include 19-inch alloy wheels, HID xenon headlights, panoramic sunroof and parking assistance sensors. Hyundai ended the survey when the customers agreed on a $35,000 price tag, minus of course, the destination charge. For comparison, a RWD Genesis sedan with the 3.8-liter V6 will go for $35,050 including the $850 destination fee.